Anyone wondering what has inspired Nazli Aytekin to pursue a career in anti-aging does not have to look very far. "My dad is an anti-aging professor," she smiles, "so it is an area I have always had a particular interest in. After my A-Levels I found myself working as the head sales and licensing officer for the International Paralympic Committee, but I was always keen to work in the area of anti-aging." In order for Nazli to achieve her goals, she needed to rethink her qualifications. "I had a degree in English Language and Communication, but needed to get more scientific qualifications under my belt," she recalls. "I took a Foundation degree in Applied Sciences at LSBU to get myself on track, and I was so impressed with the place that it became an easy decision to carry on my education here." 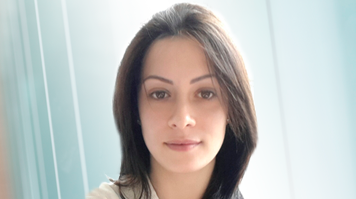 Nazli decided to focus on ways of combating aging through nutrition, and enrolled on our BSc (Hons) Human Nutrition degree. "I was always interested in nutrition, and my interest in the anti-aging field was always based on a preventative medicine approach – so nutrition was an ideal area of study," says Nazli. "The course at LSBU is accredited by the Association for Nutrition so I knew that it would cover the kinds of topics I needed to emerge with a recognised degree, and my experience of studying at Foundation degree level meant I already had lots of confidence in the academic staff here." Nazli's confidence was certainly well placed. "The course was very well designed, and really interesting. It was so relevant to what is going on in the world right now, but it also looked at the challenges the industry might face in the future," she says. The lecturers were excellent – they all had good backgrounds and were really helpful. It kept me motivated and enthused the whole way through my course. Nazli's motivation and enthusiasm certainly paid off when it came to her results. "I graduated with a First Class Honours degree – I was top of my class and had the second highest grades in the entire faculty," she says proudly. "After that, I knew I wanted to push myself as hard as possible, so I decided to apply for a PhD and secured a scholarship." Nazli's PhD is focused on developing a cheap, safe and practical therapeutic solution for age-related sarcopenia (muscle wastage), which can be rolled out at a public health level. She believes it will provide her with the perfect background to the career path she hopes to take. "Once I have completed my education, I intend to work as a doctor in the field of anti-aging and preventative medicine," she says. "I want to develop therapeutic approaches to tackle the aging process and to prevent age-related diseases such as cancer, cardiovascular diseases, diabetes and insulin resistance, obesity, and obesity-related metabolic issues." Nazli's study aims alleviate the risk of falls - a leading cause of death among the over 65's - by developing therapy that will maintain muscularity. "Since we now live in an ageing population, such a measure will make a significant contribution to reducing the socio-economic burden on the state and on the individual," Nazli explains. "More importantly, it will increase the period of functional independence in old age and redefine the experience of later life." As a result of her success so far she's also working as a university lecturer: teaching public health and contributing to teaching in human nutrition and scientific skills.